When were you approached to work on the Young Bond project and how did the idea come about? About six months ago, maybe a bit more like a year ago, when Hurricane Gold was first coming out and we were asked if we wanted to do it. I said it was such a great idea. It was just great to get involved. It’s the kind of thing that is very uplifting and more fun than your normal trophy or silver object. 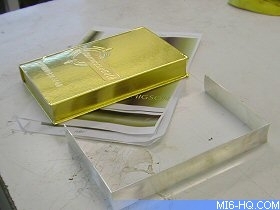 It was really the publishers who realised that the book was going to be metallic and look like a gold block. 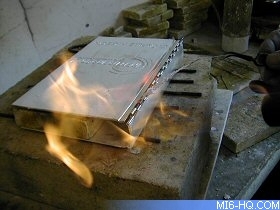 They had the idea to get in touch with us, because we’re well known for doing unusual objects in silver and gold. They got in touch, we loved the idea and it just went from there. What was the difference between creating this piece to some of your regular works? Well I think that with any piece like this it has to be perfect. The bigger the flat polished surface, the more difficult it is. To get a really crisp finish like a book – where everything is absolutely flat and geometric – it’s always very tough to get it really, really good. It’s just one of those things, because you’re using hands rather than machinery to make it. Interestingly with silver, often what looks simple is what is most difficult. When one’s doing something like a book it’s much tougher than a round piece or an animal or something that has a lot of surfaces to it. 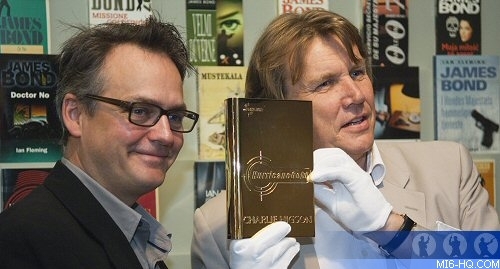 Above: The gold book is unveiled by author Charlie Higson and creator Theo Fennell at the "For Your Eyes Only" exhibition. From start to finish; around about five months. There’s a lot of work involved, a lot of people involved. It has to be absolutely right. Each time you get to a certain level, you need different help and the client’s “OK”. It’s a long and painstaking process. How did the process work and how often did you have to check-in with the clients? In this case, we didn’t need to get too much approval because they are aware of our work. They’ve seen our work before so they know we’re going to get it right. There are various stages that you want to make sure the surface is right, that the colour is right; that the logos and technical bits are ok. Were there any other technical difficulties in the sense of design and logistics? Not really, it’s just that with a book like that the hinge has to be perfect or it can look terrible. It needs to be very, very crisp. Anything that is hinged like that, with a piano hinge, needs to be really well done so that you don’t see the joins. 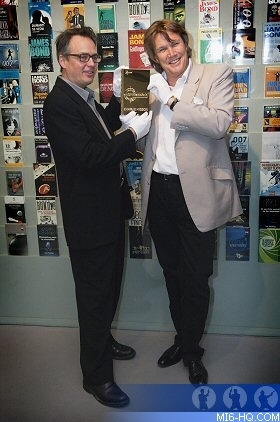 Did you get to see Charlie Higson’s secret note? I got to see everything! I’ll have to kill you if I tell you what it says. Absolutely no hints! Were you aware of the Bond celebrations this year and what did you think of the Imperial War Museum exhibit? Well I love the Imperial War Museum anyway. It’s just one of my favourite museums. It’s a fantastic exhibition – I just love all that kind of stuff. I think to mix up reality and fantasy in that way is just very engaging. I loved it! On the whole, how did you feel about your involvement in the Hurricane Gold Project? We love doing work like that – it makes life that much more fun and it’s great to see that kind of thing giving a bit of publicity to the craftsmen who normally don’t get any kind of coverage. It’s nice to see their work in lights, as it were.